Theresa Marie Haunani Bernardino was born on September 10, 1949, in Honolulu, Hawai‘i. She was the eldest child of August Anthony Bernardino and Bernadette Kealohaonālani (Amina) Bernardino. Haunani was exposed to music at an early age and began taking accordion lessons at age three. As a child, she and her mother would sing to radio music while cleaning the house together on Saturday mornings. Haunani also learned guitar, ‘ukulele, piano, and chorale singing, and, by the time she was a teenager, she was an accomplished musician. Haunani attended St. John the Baptist School in Kalihi and St. Joseph’s School in Waipahū and graduated from St. Francis Convent School in Mānoa, Class of 1967. She attended the University of Hawai‘i at Mānoa, earning a B.A. degree in German in 1971. In her sophomore year, Haunani spent the summer in Europe traveling with other German majors to London, Switzerland, Germany, and Austria. In her junior and senior years at UH-Mānoa, Haunani began serious study of Hawaiian language, music, and culture. She took many Hawaiian classes and learned from kūpuna such as Mary Kawena Pukui and Sarah Nakoa. She said she discovered Hawaiian learning was fun! Haunani was an active part of Ka Leo Hawai‘i Hawaiian language radio show, Ahahui ‘Ōlelo Hawai‘i, and Hui Aloha ‘ĀinaTuahine, Hawaiian language perpetuation projects during a period that later became known as the Hawaiian Renaissance. During this time, Haunani was hired as a lecturer in Hawaiian language at UH-Mānoa where she taught for many years. Over the years, Haunani composed many songs. Her composition Lei Pukana was chosen as the first place winner in the Search for Songs Contest in 1976. She recorded this and many other songs on the album Nā Pua O O‘ahu with the group Kaimana. She was also renown for her skill in vocal arrangements, particularly her arrangements of Hawai‘i Pono‘ī and Ho‘onani I Ka Makua Mau. 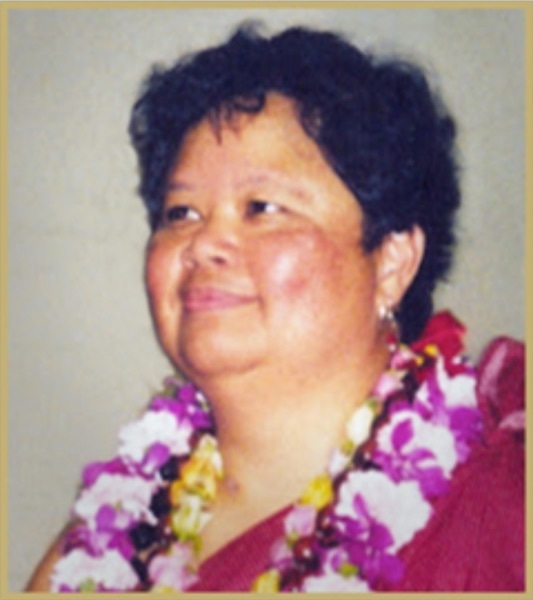 In 1984, Haunani began working on a Masters in Education degree at UH-Mānoa, which was conferred upon her in 1988. In Fall 1990, she became an Assistant Professor at the University of Hawai‘i at Hilo. She taught Hawaiian language, ‘ohana, and music classes and was instrumental in the establishment of Ka Haka ‘Ula O Ke‘elikōlani College of Hawaiian Language. Haunani directed the graduation ceremonies at UH-Hilo for many years and composed the school’s alma mater, Pulelo Ha‘aheo, with several of her colleagues at the College of Hawaiian Language. In summer 1993, Haunani was diagnosed with colon cancer. Over the next three years, she underwent three surgeries and three long cycles of chemotherapy. After the first and second surgery, she was able to return to teaching at UH-Hilo, but only for a short time. Both times, the cancer returned within a few months and she needed to undergo more treatment. After the last surgery in December 2005, recovery was slow and difficult. Haunani was hopeful she would return to teaching in Spring 2007, but it was not to be. She passed away unexpectedly on Sunday, August 27, 2006. Throughout her years, Haunani shared her music and ‘ike (knowledge) with thousands of people. Many of her students over the years are now teachers themselves of Hawaiian language. She had a passion for all things Hawaiian and insisted on excellence. Haunani is survived by five siblings – Ku‘u Lei Momi, Mona, Julie, ‘Ewalani, and Andrew, and a niece, Emma Kealohaonālani, whom Haunani named after their mother. Upon her passing, Haunani’s family decided to create a memorial scholarship in her name as a way to say thank you to UH faculty and staff, many of whom contributed vacation hours to Haunani during her illness. Haunani was especially thrilled to work with her colleagues at Ka Haka ‘Ula O Ke‘elikōlani and be part of the larger academic community. In appreciation, her family is pleased to establish the UH-Hilo Haunani Bernardino Endowed Scholarship for Excellence.